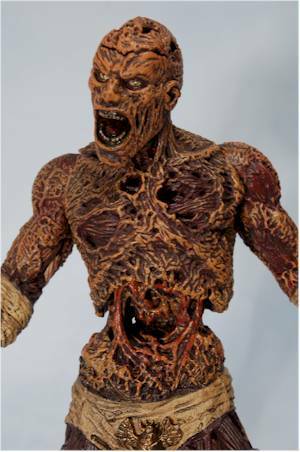 Many years ago, a company called Mcfarlane Toys came up with a line of action figures that was brilliant - a series that would contain classic characters from famous movies that stood on their own. These were great figures that would never be made otherwise, since the license couldn't possible support multiple characters. By developing a line just for them, they gave fans many characters in plastic that they would never have gotten otherwise. In recent years, other companies have latched onto this idea, expanding on it with their own style. One of these lines is Now Playing, from the talented SOTA Toys. 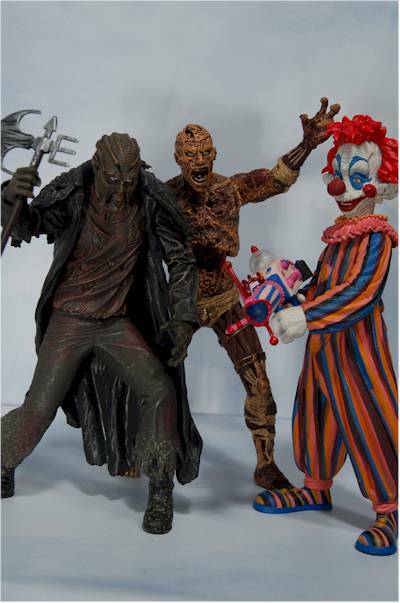 The second series is now hitting stores, and includes the Creeper from Jeepers Creepers 2, The Mummy from Mummy Returns, and the Klown from Killer Klowns from Outer Space. It is interesting to note that SOTA is being very smart about this. Oh sure, they could have used Creeper from the more popular first film - but the character is almost the same, and I'm sure the licensing rights for the sequel were far less expensive. The same can be said for the Mummy of course, showing that they are looking to make interesting and popular characters, but are smart enough to find a cost effective way to do it. These are hitting online retailers right now, and sell for around $12 each. 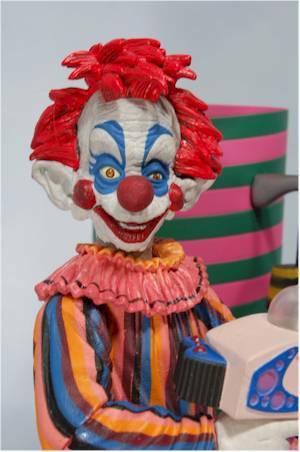 The first series had a number of exclusives, but this time around there's just the alternately colored Klown figure, intended as a Tower Records exclusive. One of the areas that is not SOTA's strong suit is the packaging. Fortunately, the second series has gone to a more traditional size of clamshell (the first series was in a very oversized package), but the graphics are still about as boring as you could get. While some folks are sure to have their favorites out of this set, all three sport terrific sculpts. 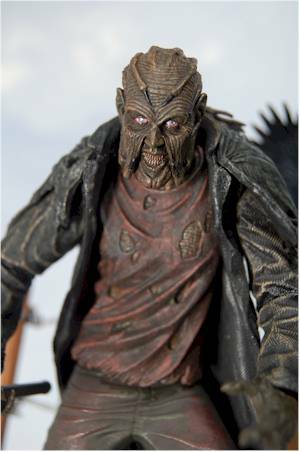 My favorite is the Klown, mostly because a) I've been waiting forever for a figure from this cult classic, and b) he's such a visually arresting character. Clowns are scary, just ask Kramer, and Killer Klowns, well, they're killer. His sculpt has excellent detail, particularly in the face and hair. The hair is a slightly softer material as well, with good texturing and a natural look. The Klown stands great on his own with those big shoes, and the sculpt works pretty well with the limited articulation. My next fav is the Creeper. I already have the 12" version from Majestic, so this isn't the first of this character in my collection, but now I have a size that fits in nicely with the later Movie Maniacs and other lines like Cult Classics. There's a ton of texture detail on his clothing, done predominately with a cross hatch style, that works surprisingly well. The face looks terrific, and while the sculpted stance is really intended for use with the display base, it is possible to get him to stand on his own. You'll have to turn his front foot inward (notice in the photos), but it is doable, and he stands fairly sturdy in that pose. His hand sculpts work great with both the weapons and the overall design of the figure, and with the included extra right hand, he can even hold the tiny knife quite easily. Finally, there's the Mummy. I suspect some folks are going to be disappointed with this sculpt, but that's not really fair. It IS very much like the prototype, although not quite as detailed. There is gaps in his body on the left forearm, through the stomach, and even through the head, but they are fairly small and only obvious at just the right angle. There is a ton of texture and detail in the rotting flesh, but some of this is lost in the less interesting color pallette. He stands great without the base as well, another plus in my book. All three fit in nicely in scale with other recent movie themed lines from companies like NECA and Mcfarlane. 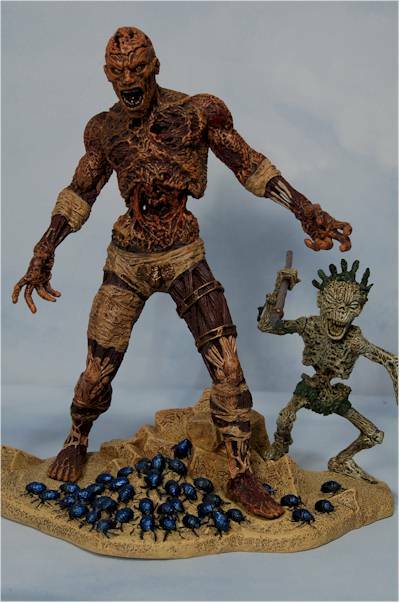 These are really a 7" scale, so early Movie Maniacs that were closer to a 6" scale may appear too small. 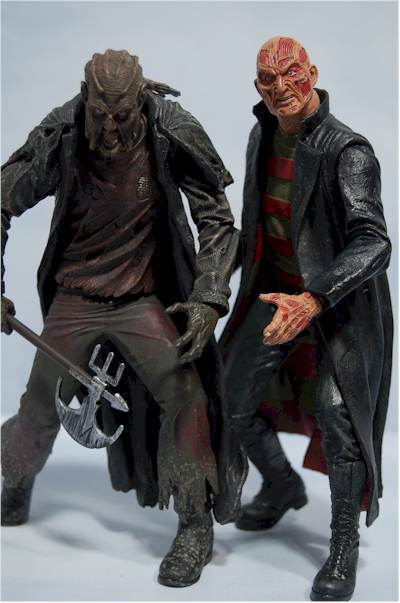 Notice the photo with the early Mcfarlane Michael Myers, along with the newer NECA Cult Classics as an example. Of the three figures, the best paint work is done on the Creeper. He has a fairly bland palette, but they use a variety of finishes and effects to make even basic colors like brown more appealing. The eyes, teeth and 'claws' (for lack of a better term) on his head are all done with a gloss finish, setting them apart from the matte skin and clothing. There's some use of wash and dry brushing on the coat and jacket, but it is just right - not overdone. Even the muddy splatters on the boots and hat work much better than usual in this scale. The colors are much more vibrant and varied on the Klown, but unfortunately, he suffers from weak masking on the costume. Each of the color stripes bleeds into the next, with very little definition between them. This may have actually been intentionally, in an attempt to give the costume a 'cloth' appearance, but if so it didn't work as intended. However, the work on the Klown's face is excellent, with good masking around the blue and white. All the wild, bright colors also make this a character that will stand out on a shelf of normally drab monsters. The paint ops on the Mummy don't show off the sculpt quite as well as they could have. Much of the detail is lost in the similar colors, and the largely dark and muddied appearance hides much of the intricacy. They did add the very colorful beetles to the base, which was a very smart move and gives the overall figure more pop, but when comparing this to the prototype, it's the paint that falls short. None of these figures is super articulated, but they have useful articulation. You don't have to have a ton of articulation to have a good figure, if it's the right articulation. All three have the oh so important ball jointed neck. For Creeper and Mummy, the joint is at the top of the neck, up under the jawline. However, for the Klown, it's at the base of the neck where it attaches to the body. Smart move on SOTA's part, changing the design to what best suits the character. All three also have ball jointed shoulders, and these are useful ball jointed shoulders, with a nice range of movement. These aren't silly ball jointed shoulders which barely move away from the body, oh no, these allow you to raise the arm up over the shoulder line. 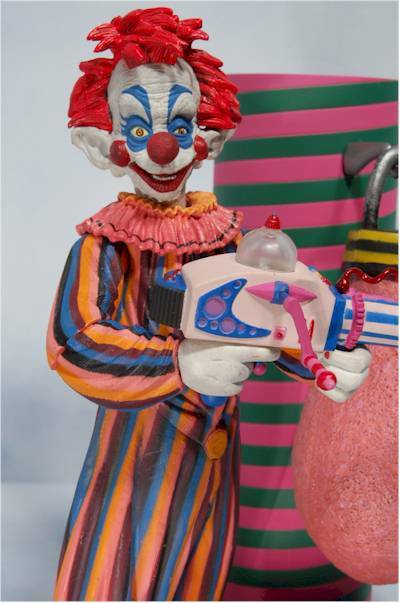 The Klown rounds out his articulation with cut elbows, cut ankles and cut wrists. He doesn't have a waist joint to avoid breaking up the flow of the stripes and costume. The Mummy has cut joints at the elbow as well (actually slightly below the elbow), and cut calves, but no cut wrists. He also adds a cool swivel joint at the chest that allows for the figure to tilt from side to side, but doesn't turn. Finally, the Creeper also has cut elbows, wrists and ankles (at the boot tops), along with a cut waist. He lacks much leg articulation, but the arm articulation works very well for producing lots of menacing poses. Considering these figures are in the $12 range, the number and quality of the accessories is extremely good. 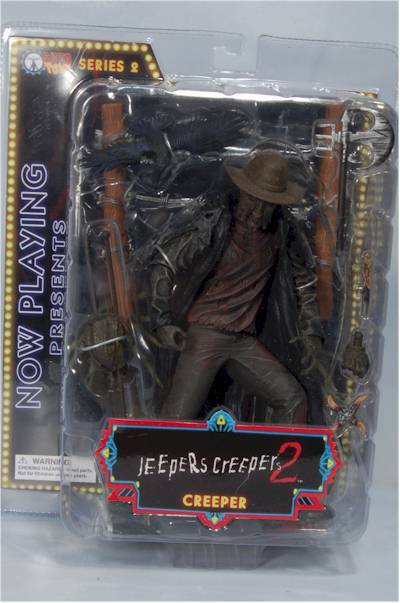 The Creeper comes with his removable hat, plus a whole second head. This head has the impaled eye socket from the film, and no pony tail. The heads pop on and off easily, and both look great. He also has an extra right hand, specifically designed to hold the small knife. The regular hand holds the battle axe nicely, and both the axe and knife have sculpts that match the source quite well. There's plenty of detail, and the additional 'blood' on the blades looks good. And just to round out his arsenal of death, there's the bone throwing star, which can be positioned in his open left hand if you work it just right. Each of these figures has a display base, and the Creepers includes a removable crow, just taking off in flight (or perhaps landing). 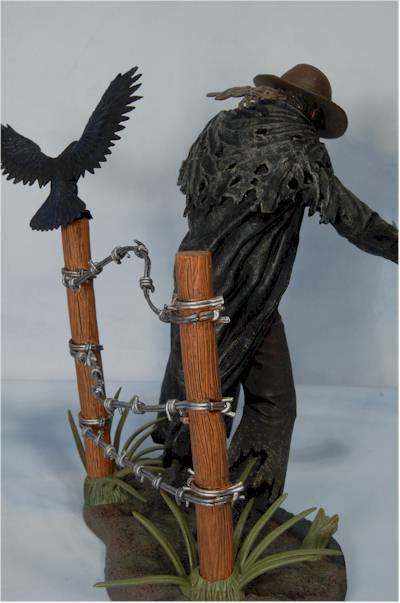 The barbed wire fence is next to a highway, onto which the Creeper is about to step. The base is a great addition, and one you'll be happy to include in your display. 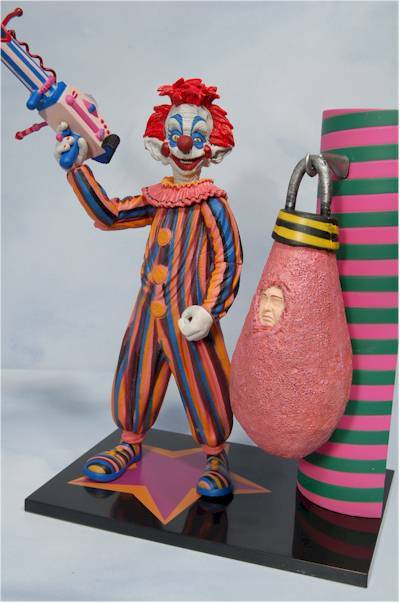 The Klown has a piece of the ship's interior as his base, which includes a hook to hang one of his victims, wrapped up tight in his deadly cotton candy. This human/candy combo is one solid piece of plastic. He also has his special ray gun, and the 'popcorn' in the top is actually loose and bounces around! He can hold the gun easily in either one hand or both. The Mummy also has a display stand that includes the aforementioned colorful beetles. There is also a place on the stand to place the smaller figure, who you'll remember from the jungle scene late in the film. These little guys were running around making things difficult for Brendan Fraser and company. 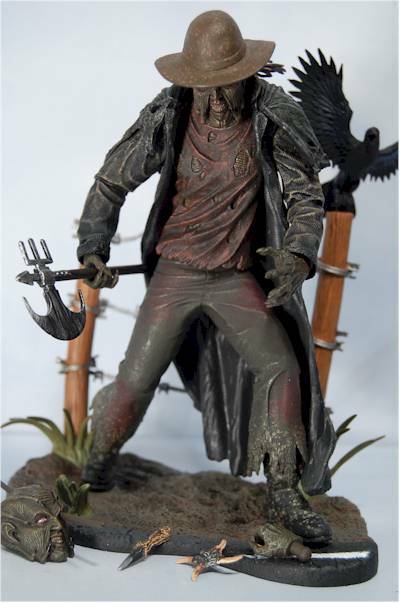 He is extremely well sculpted, with plenty of detail, but suffers from some of the paint issues as his master. He also comes with a spear that can be held in his left hand. This is certainly an above average value in our current market. At just $12 each, you're getting well sculpted figures with great accessories of licensed characters, which is getting more and more rare these days. Enjoy it while it lasts! The articulation and accessories, along with the very solid build quality, actually make these pretty good toys. 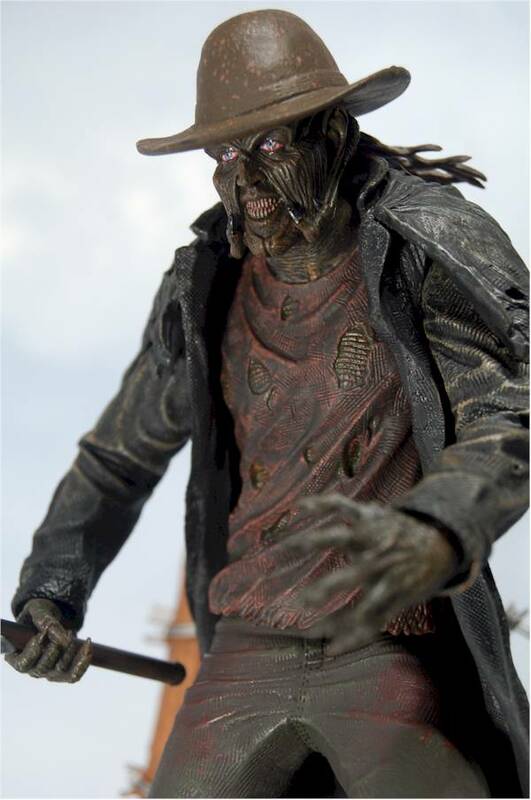 However, I'm not sure too many kids will find the Klown all that interesting unless they've seen the film (which is unlikely), and Jeepers Creepers is probably a film they shouldn't be seeing. The Mummy scores a little better because kids in that 10 year old range are certainly fans of mummy's in general, and he could easily be a rather gruesome foe for a variety of similarly scaled good guys. Take some care when popping them on to the display stands, as the fit is a little tight and you don't want to accidentally snap a peg. Here's some truly unique and visually interesting monsters to add to your growing collection of evil doers. The scale on these allows them to fit in with most other recent lines from other popular companies, and the style and design make them stand out on the shelf. While I loved series 1 of the Now Playing line, especially the Demons, this is a better overall series, and shows a real commitment to the future of the line. 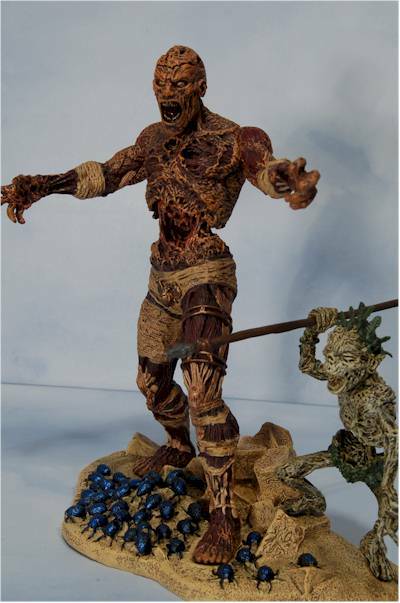 With the quarter scale Pumpkinhead and Legend of Darkness figures due this year, along with the possible release of both series 3 and 4 of the regular line plus at least one boxed set, this may be one of the hit lines for 2006. The paint ops on the Mummy hold him back from hitting the same score as the other two, and he is likely to be the one figure people have some complaints about. A large part of that though is simply due to the tremendous expectations that were set by the stunning prototype. 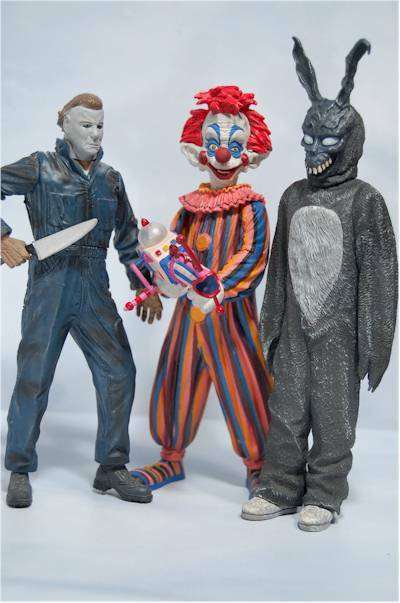 - Killer Toys has the set of three for $33, or the individuals for $12. - CornerStoreComics has the set of three for $35, and the individuals for $12. - Amazing Toyz has the individuals in stock for $12, or the full set for $35. They also have the exclusive colored version for just $12 each. 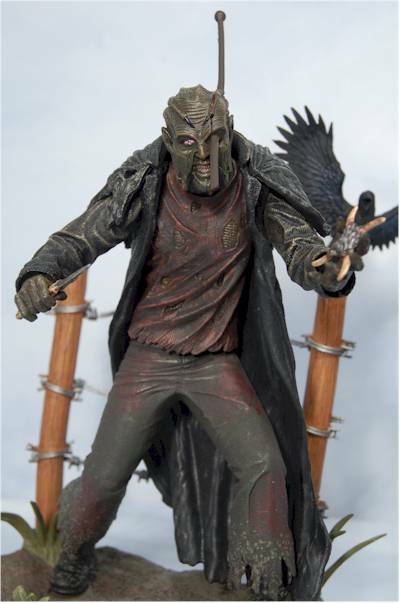 - Alter Ego Comics has the set of three at $38.22. - YouBuyNow has the individuals for $14 each. Let's just stick with the first series of Now Playing - I reviewed both the Darkman and the Nightmare Demon. - there's also the review of the 12" Creeper, just in case you'd like to see how much better this small version is.